Are you struggling with training your Rottweiler, or thinking about getting a Rottweiler puppy? Does your Rottweiler ignore you or disobey your commands and you don’t know why? 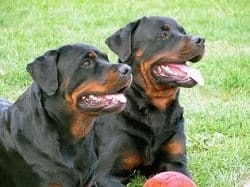 Are you worried about your Rottweiler having aggression issues? If you answered “yes” to any of these questions, then maybe I can offer you some helpful advice. I would like to discuss some very common issues with Rottweiler training. Whether your companion is a puppy or an adult, you not only need to learn how to use positive reinforcement, but you also need to learn the most important rule of dog training…PATIENCE! Training is an ongoing commitment that you must continue to carry out every day. Just because he or she has learned the commands you have taught them this morning in your living room does not mean they will remember that command tonight or tomorrow, or when you take them to the park, or put them in the back yard. It is very important to start your Rottweiler’s training at a young age. I would recommend starting training immediately. You will have the most success if you start training your puppy between the ages of 6 weeks and 6 months. If your Rottweiler is older, it may take a little more time, effort, and patience on your part. But do not let this discourage you! The Rottweiler is known for being a very intelligent, obedient, and loyal companion. They want to make you happy, so don’t be discouraged if your Rottweiler is older and untrained. Positive Reinforcement training and proper dog communication can help you to train a dog of any age. The idea of dominance based training is that we constantly establish rules that the dog will follow, in order to improve his behavior. Dominance is a dog training term that is overused, and often misunderstood. We do not need to show dominance towards our dogs, just kind and careful understanding. There are several things you can do to encourage good Rottweiler behavior without being rough with the dog. You should never show aggression towards your dog. If you think that hitting your dog will prove your position and control to him or her, then you are going about training the wrong way. It is very important to make sure your Rottweiler is comfortable around other people as well as other dogs. This can be done by taking your puppy out for walks, to the park, over friends houses, and also invite your friends over to your house. If you want your puppy to be happy and comfortable, it is important to socialize them. Social contact with other dogs and people is exactly what will shape a puppy into the kind of dog he will become. Socialization in many ways is more important than dog training for the well being of your Rottweiler. Keep every social experience that, your dog has, nice and positive. These experiences are where he learns to be confident or afraid. Once your dog has learned some commands, you can also try using sit, or down, or paw to distract them. 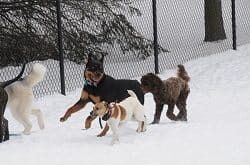 Dogs have a very short attention span, and a very short term memory, so these simple distractions can really help you establish good social behavior. Positive Reinforcement is training your dog by adding a reward to his actions, usually the ones you would like him to repeat. Training by reward is the best possible way that you can communicate with your dog. If you reward any behavior which you would like to see him repeat then you are talking to him in a language that he understands. The Rotty doesn’t understand English, or even human very well, but he will soon learn which behavior brings him a welcome reward. A very effective form of dog training that works wonderfully during your training sessions is to make your training feel like a game. For this you can reward with treats, toys or praise. When you are trying to teach your Rottweiler a command and they perform the command to your liking, immediately give them their reward. 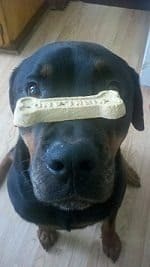 A note on food rewards – Rottweilers are notorious for being overweight, and since training can be a long process, you can accidentally give your dog too much food and he can become fat and unhealthy, so take care with high fat treats. Physical discipline should never be used during training. If you are teaching your Rottweiler a command and they do not perform the command you are asking of them, it is counter productive to hit the dog or yell at the dog. This only causes them to be fearful, and even discourage them from learning the command altogether. If you feel frustrated walk away, do something else for a while and try again later. Yelling and losing your cool only frightens and confuses the dog. Good dog training has perfect timing. The Rottweiler that is punished for toileting in the home three hours earlier has no idea what he has done. This dog should not be punished at all, because punishment will never work. It is an act used in dog training that is equally common and useless. If you reward your dog for sitting, just as he gets up and walks away, he will be very pleased. You have just rewarded him for walking away though and next time you ask him to sit, guess what, he is going to remember that and walk away again. Your Rottweiler, whether they are a puppy or an adult, must learn some simple commands to complete your training. These commands must be taught using the positive reinforcement exercises I discussed earlier on. 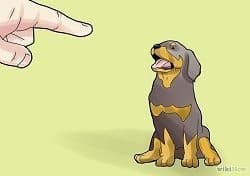 With these basic commands, you will be well on your way to owning an obedient and well behaved Rottweiler. The very first command you should teach your Rottweiler is “sit”. This command is essential in making your life easier. You teach them “sit” and tough tasks like feeding and grooming can become a whole lot easier. To get your dog to sit, you first must make sure you have their attention. I prefer to use my hands over my voice because this teaches your dog to focus on you. Voices can be drowned out and ignored. If you get your dog to focus their attention on your hands, they will be more likely to pay attention to what you are asking them to do. But I would recommend also using short, one or two word commands along with the hand signals if you want them to also learn voice commands so they can also learn the command by listening as well. This is a simple command that can make nail clipping easier for you to perform. This must not be taught until the dog is familiar with the “sit” command first because they must be sitting to execute this command. This is a very important command to teach your dog. They need to understand when they are doing something wrong. To teach “no” you must establish your disciplining voice. Use a firm and lower toned voice. It is also very important to remember not to overcomplicate things with words. Just say “no” or use another word you like, such as “stop” or “bad”. It is very important that you determine which word to use and to use that word only when disciplining or discouraging your dog. Please remember you only use this command when you catch your dog in the act of doing something bad. Once you say “no” and he stops, go on with your business as normal. If they continue to be bad say “no” and remove them from the situation. This can be a tricky command to teach. Remember to keep your commands simple. Just simply say the word “down” and use your hand in a downward motion, palm facing the ground. The motion of your hand moving down towards the ground will help the dog understand that you want them to lay down.This command should be taught after the dog understands sit. Definitely the most frustrating command to teach. This one takes the most amount of patience. Your main job is to not get discouraged or aggravated. As long as we have established the “sit” command, we can start to attempt “stay.” If you are far enough into your training where you have successfully taught your Rottweiler “down” then this may be even easier for you. This command should be taught only after the dog has learned “stay.” This will be a fun command for your Rottweiler to learn because they are a breed that loves your company. This may be the most important, as well as the hardest step in training your Rottweiler. Patience is the key. Always keep your cool and stay calm. Remember that your dog is your companion and they want to make you happy. If you are calm, they will be calm. The more patience we use the better results we will get. Remember, when training your Rottweiler, you always want to make it as fun and simple as possible. No need to over­ complicate things, or yell, or get angry. It’s just a game to them., and they love to play, so if you keep it fun and use patience, you will be successful. A dog is not trained over night, nor does training ever really end. It is an on­going process that, as a pet owner, you are responsible for. Training does not have to be boring and tedious. You can make it as fun as you like. The more fun it is for you and your Rottweiler, the easier it will be to train them. And patience is the key. So, keep up the good work, and don’t get discouraged. Training your Rottweiler will make you both very happy. Excellent article ~ I loved reading it and agree with every single point you made! I am all about responsible dog ownership, and can’t point out the importance of ongoing socialization & training often enough. I’m the proud owner of Missy & Buzz, two Boxer-Chow-Chow mixes whom I raised from puppyhood, by applying ONGOING, CONSISTENT positive training techniques. Hi Barbara, thanks for your comment, I really appreciate it! I have a 1 year old Rottweiler but he is acting up in a way of climb in on top of me and he is not listening to my commands at all. I really need help because i love this kind of animals and my dream is to have a pet that follow my commands specially if it is my animal. Hey Roberto, thanks for stopping by and commenting! What you have here is a clear sign of dominance issues. Please take some time and read through all the articles which are describing this type of behavioral problems. You can start with this one,regards.